Complete track list for all 5 included discs below. The physical version of this title is sold out and out of print. Amazon and some select dealers may still have it available. 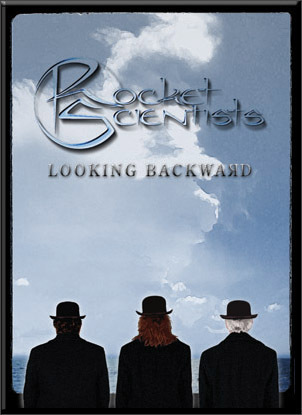 (November 26, 2007) Acclaimed California prog rock band Rocket Scientists has announced the release of LOOKING BACKWARD, a multi-disc package that reissues and revisits their back catalog in grand fashion. LOOKING BACKWARD contains expertly remastered CD editions of the band's first three studio albums, EARTHBOUND (1993), BRUTAL ARCHITECTURE (1995) and OBLIVION DAYS (1999) along with bonus tracks on each disc. All of the original artwork is included in the package as part of a full-color 64-page 5x7 book. The LOOKING BACKWARD book also contains thorough liner notes and commentary from the musicians along with extensive photos by Raj Naik, Neil Zlozower and Scott Streble. 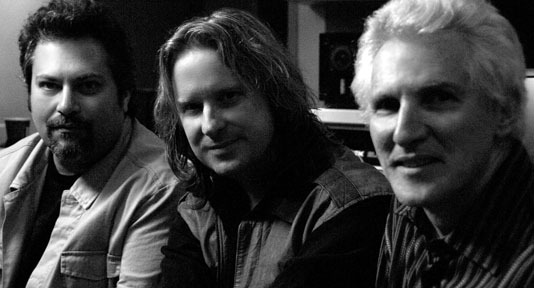 To complete the LOOKING BACKWARD package, the core Rocket Scientists musicians, Mark McCrite (v,g), Erik Norlander (k) and Don Schiff (Stick), returned to the same Los Angeles area studio where they recorded the early albums and commenced a series of new sessions with drummer / percussionist Greg Ellis who appears on Norlander and Schiff's solo albums as well as on the Rocket Scientists OBLIVION DAYS album from 1999. The quartet recorded a new disc of "live in the studio" material where they reinterpreted songs from the band's early studio albums, some with the benefit of over 15 years of perspective. This fourth disc, "The 2007 Sessions", chronicles those recordings. Additional unreleased material recorded over the years was added to "The 2007 Sessions" disc including a special version of the Rocket Scientists classic, "Mariner", with guest vocals from long time Erik Norlander collaborator, Kelly Keeling. Two songs from the OBLIVION DAYS album, "Escape" and "Break the Silence", were also remixed especially for "The 2007 Sessions" disc. But the band didn't stop there. Producer Erik Norlander brought in an HD video crew to film The 2007 Sessions, and these live-in-the-studio performances appear in the LOOKING BACKWARD package on the fifth disc, an NTSC region-free DVD. The DVD also includes lengthy interviews with the band as well as historical footage going all the way back to the first album recording sessions in 1992. Norlander also filmed a bonus featurette, "An Afternoon with Emmett Chapman" where Stick maestro Don Schiff discusses his groundbreaking instruments with their creator, inventor Emmett Chapman. The band has posted three videos from the LOOKING BACKWARD release on their YouTube channel at http://www.youtube.com/rocketscientists. They have also posted four of the new recordings on their MySpace page at http://www.myspace.com/rocketscientistsband. LOOKING BACKWARD is a superb collection of Rocket Scientists recordings packaged on a grand scale. Fans of Rocket Scientists, Erik Norlander and progressive rock in general will find this to be an essential part of their CD and DVD collection. "A BRIEF HISTORY OF ROCKET SCIENCE"
This Looking Backward set has been many years in the making. The early Rocket Scientists CDs have gone out of print one by one as stock ran out, contracts expired or even record labels expired! Think Tank Media has reissued several catalog titles of Lana Lane albums and my own solo albums, and some of those reissues have been done as "Special Edition" releases with bonus tracks and expanded booklets. We thought about doing something like that for Earthbound, the 1993 debut album from Rocket Scientists, and I had the crazy idea of not just remastering or even remixing, but rather actually re-recording the whole album with the band as we would play those songs now. Mark and I actually started pre-production on new versions of many of the Earthbound songs while we were arranging and recording the Revolution Road album in 2006. The idea was that Earthbound would be reissued as 2CD set -- the first CD would be all new recordings of the album, and the second would be the original album, either remastered or simply untouched. This was truly a grand plan ... and we didn't do it. The reason we didn't do it was threefold: time, resources and a third, not-so-small point, the rest of the back catalog that was beginning to fade into oblivion. The Kinesis label release Brutal Architecture, the second Rocket Scientists album, back in 1995. In addition to being a record label, Kinesis had always been a stalwart mail order CD shop. Several years ago, Kinesis converted all of their efforts into the CD shop business and essentially stopped making label releases. The final pressing of Brutal Architecture was running low, and if there were going to be any more, it was up to my company, Think Tank Media, to make them. Fair enough, but again, wouldn't it be great if we could do something a little bit special with the album rather than just press up more of the same so many years later? The band's third studio album, Oblivion Days, from 1999, also had met a peculiar fate. While the title still is in print in Japan on the Avalon label, the European company that released it had gone out of business with the stock of this title essentially sold through. There had never been a North American version of Oblivion Days -- Think Tank Media and other companies had simply imported CDs of this title from Europe and Japan. But as the US dollar continued to sink in relation to other currencies, it became more and more price prohibitive to bring in the imports. We needed a US pressing of Oblivion Days. So as three separate back catalog reissue titles were clearly called for, I came onto a new idea: "box set". Mark and Don loved this idea as did many of our distribution and retail colleagues. I had a nice lunch with Mark McCrite and ProgRock Records chief, Shawn Gordon, at the January 2007 NAMM show in Anaheim, California where I presented the scope of the project to them both. We would go in and record 7-8 new versions of old Rocket Scientists songs essentially "live in the studio" with Mark, Don, myself and drummer / percussionist Greg Ellis with whom Don and I have worked on several solo albums. Greg also drummed on half of the Oblivion Days album, so he was the perfect and logical choice for these sessions. We would also bring in a video crew with high definition equipment to shoot the sessions along with some interview footage at the end of the recording days. That footage would be compiled for a DVD to go with the set, and the audio tracks would become a fourth CD. To complete the CD, we added some special versions of other songs from the Rocket Scientists catalog, notably from the Brutal Architecture and Oblivion Days albums. These tracks would balance out the CD since the new recordings were primarly focused on songs from the Earthbound album. Then we would remaster the first three studio albums, Earthbound, Brutal Architecture and Oblivion Days, and include all the bonus tracks associated with these CDs. Mark even found a great demo from the Earthbound period that included on that disc as well. The whole package would be artfully documented in a 64-page booklet, or rather, BOOK, that would feature all of the songs lyrics, photos from all of the old albums and the 2007 sessions, and commentary on the songs from Mark, Don and me. What a package. And guess what? We did it! The Looking Backward set is available for legal download at Bandcamp and iTunes as four separate albums. You can also download individual tracks. Here is the links to Rocket Scientists Bandcamp site. My God, it is now already 15 years ago that ' Earthbound ' from Rocket Scientists became one my dearest prog works (and still is). Also after the two successive albums, ' Brutal Architecture ' (1995) and ' Oblivion Days ' (1999) have since long gone out of print, it naturally makes sense to publish the albums again. But instead of bringing them all out individually, the Rocket Scientists have packed everything into a big box and put yet another CD with new recordings and also a new DVD. The weight of the box then increases still with an extremely thick 64-page booklet in the DVD format. ..... The 3 albums cover the versatile musical evolution of the Californians. .... For those who have until now still not heard the Rocket Scientists, they can now acquire these CDs quite low-priced and experience the band at the beginning of their career. .......As one who only had the Rocket Scientists second disc Brutal Architecture in the collection the Looking Backward box set is a real eye-opener to the talent that exists in this band. I mean we've all heard about either the band or their solo efforts, but having the opportunity to hear each of these releases remastered and in some cases re-done is quite amazing. Having the DVD is just the icing on the cake. This is a no-brainer to add to the collection. Looking Backward is an amazing set that has been spending a lot of time on my player and will for the foreseeable future. If you're into symphonic prog this set is Highly Recommended. ......Rocket Scientists have been moving closer to climbing that ladder into the realms of prog royalty. .......Whether "Looking Backward" can be considered an introduction to those who have never heard of the band before, a historical perspective for those who discovered them on "Revolution Road" or a collectors item for long time fans, Erik Norlander and his cohorts have outdone themselves here. A slipcase over the VHS-sized container 3 (count 'em - three) excellent re-masters/re-recordings with a sound quality that will knock your socks off.A fourth CD with previously-unreleased recordings. A DVD containing more than 2 hours of material. An excellent and informative 64 (count 'em - sixty four) page glossy booklet. A total of more than 6 hours (count 'em - six) of modern third-wave symphonic progressive rock ..... Looking Backward is a retrospective compilation of 14 years of the Rocket Scientists' releases (excluding their recent Revolution Road) .......this is clearly a 5-star product. The press release says it's a must-have for Rocket Scientist fans. It's wrong. It's a must-have for any progressive rock fan. It's not hard to feel the love that no doubt went into putting Looking Backward together. This is an enormous package, a wonderful retrospective of the early career of Rocket Scientists. First of all, the booklet that comes in this set is one of the best you will ever see, jam packed with information on all the three remastered albums, photos, and commentary from the musicians. The DVD is a fascinating watch, filled with interview segments and in-studio footage, as you get up close and person with Erik Norlander, Mark McCrite, Don Schiff, and crew. If that's not enough, the inclusion of brilliantly remastered versions of Earthbound, Brutal Architecture, and Oblivion Days, is the icing on the cake......Great vocals, stupendous keyboard work, tasty guitar lines, solid rhythms, and catchy songwriting. All of these characteristics and more make up the discography of Rocket Scientists. If you are new to the band, make sure to pick this set up, and if you have all the old CD's, it's now time to replace them with what's included here. Rocket Scientists is not a band to release an album every year. In fact, their last studio album was released almost 8 years after the previous one! But their latest release took far less time to reach us. And it is not just some new release! It is an entire box set, containing no fewer than 4 studio CDs and 1 DVD! ....This box set shows their evolution from a band that carefully explores progressive rock and over the years grows to be one of the better prog bands around. Looking Backward is not just a box set, but also a piece of history. And although in school I never cared much for history, I wouldn't want to miss out on this one! This nifty box set landed on my doorstep a few days after Christmas. Containing remastered CD's of RS's earlier albums together with a disc of newly recorded versions of choice tracks and a DVD of those recording sessions, this is a wonderfully put together set.,,,,,The whole package is rounded out by a fantastic 64 page booklet which includes complete lyrics, credits, notes and photographs. Erik and his label Think Tank Media are known for the quality of their releases, from the recording, producing, musicianship, down to the artwork and packaging. On this box set they have outdone themselves. And with the exchange rate the way it is, the whole thing can be bought for around �25 so it is an absolute bargain! A retrospective box set from the American proggers and quite a tasty one at that! This release comprises the first three albums from the band some recordings recorded in session in 2007 featuring some of the band's best pieces, and a DVD disc of the band working in the studio on the sessions.....it's four quality audio discs, a video DVD and a handsome 64-page booklet with lyrics and extensive notes from the band. A lovely release!